This month eHobbies.com is up for review. Ken Kikkawa, CEO of eHobbies, submitted the site for grading. I have to say I was impressed. Chief executive officers of companies that large – #364 on the Internet Retailer 500 list for eHobbies – are usually too high level to concern themselves with any search engine optimization details. Yet here’s a CEO engaged enough that he’s reading SEO articles and emailing me. Kikkawa shared some of eHobbies’ previous SEO efforts to date and some of its successes. Among other things, it has increased the amount of content on non-product pages, crafted custom page titles and meta descriptions, and developed and launched a cross-linking initiative to extend its internal linking structure for SEO purposes. And it has received some nice gains from this work. The proof is in the search engine results pages (SERPs): number 1 for bachmann trains, number 1 for model car kits, number 2 for plastic model kits, and number 1 for model kits. The level of SEO sophistication that eHobbies has achieved is uncommon among online retailers. eHobbies has already attended too much of the basic “blocking and tackling.” Because of this, we’ll get to dive into some areas not normally covered within the scope of an SEO Report Card. With all due credit to eHobbies, it is leaving a lot of money on the table. But, too, I don’t know what “top-secret” SEO initiatives are in the works. I’m sure eHobbies’ competitors would love to read this article and find out, so I can’t fault Kikkawa for not sharing. Nevertheless, for the purposes of this article I’m going to assume the worst — that eHobbies is resting on its laurels and simply watching the dollars come in. URLs are rewritten to be search engine friendly, contain keywords, and use hyphens to separate words. This is fantastic. The problem is, however, the execution on this was flawed. Category level pages at first blush look good, such as http://www.ehobbies.com/radio-control-airplanes.html. But when special characters are present in the category name, they are replaced with hyphens, creating bizarre URLs with too many hyphens, like http://ehobbies.com/toys–games—-more-puzzles.html. On category pages, each word in the category is incorporated into the URL, which is fine. But drilling deeper, to the subcategory level, yields subcategory page URLs that incorporate the category name and subcategory names — no matter how many words long they are. That means URLs like http://www.ehobbies.com/radio-control-airplanes-rc-electric-ready-to-fly-airplanes.html (9 words) are not uncommon on the site. That is starting to look like keyword stuffing. To get to page one, eHobbies should start by understanding how the current top-ranked sites managed to pull off the seemingly impossible. Doing some digging, I was able to ascertain that some of these sites bought links with anchor text matching this phrase. You can see an example infraction at http://wildcat.arizona.edu under “Recommended Sites”– right next to links for “online casino” and “personal injury attorneys”!, This is naughty! 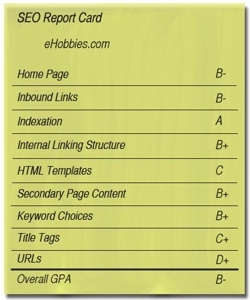 eHobbies could turn them in to Google via the Report Paid Links form in Webmaster Central. Rather than stoop to their level, eHobbies might embark on a blogger outreach campaign, sending free products to every “mommy blogger” with sons that they can find (no strings attached, of course). They could also launch link bait campaigns like “How to Build Your Very Own Robot Girlfriend” or “The 10 Coolest Robot Girlfriends and Where to Get Them” then seed these viral articles into social sites like Digg.com,. It’s important they don’t do the Digg submissions themselves, but instead tap a Digg “power user” with a lot of street credibility. Otherwise eHobbies is unlikely to get the traction and to otherwise reach the front page of Digg, no matter how good the article. Conversely, nearly everything that such top-ranked Digg users submit turn to gold: It’s typical for 80 percent of their submissions to hit Digg’s front page. In addition to “rc car” and “rc cars”, I noticed that eHobbies was lagging in the SERPs (i.e. either on page two or below the fold on page one) for terms like “rc airplanes”, “radio control airplanes”, “radio control cars”, “rc trucks”, “nitro rc cars” and “nitro rc car”, to name a few. The aforementioned http://www.ehobbies.com/radio-control-airplanes.html category page has introductory copy, which is a good addition that we at Netconcepts almost always recommend, as do other category pages. However, the links contained within the intro copy have anchor text that is too generic and unfocused, e.g. “airplane accessories” and “engines”. Searchers for airplane accessories are probably looking for the real thing rather than parts for toy models, and searchers for engines are probably looking for not only car engines but search engines, too — not model car engines. Now let’s talk about universal search. Oftentimes, a commercial query will trigger Google to add three product results from Google Product Search in what’s called a “onebox.” Google may fold that onebox into anywhere in the results page; but when it is at the top of the page — that’s when it’s especially useful. After all, Google is preempting the top natural listing. An example of this can be seen by searching “rc airplanes” on Google. Ranking well in Google Product Search takes a very different set of SEO tactics. The prerequisite for this ranking is that you have to submit a data feed of your product catalog to Google Base. eHobbies submitted over 44,000 products, as can be seen by doing a site: search on Google Base (http://www.google.com/base/html?an0=products&ay0=9&hl=en&gl=US&q=&an1=Product+type&ay1=1&ao1=0&an2=Price&ay2=8&au2=USD&ao2=3&av2=&an3=Brand&ay3=1&ao3=0&av3=&an4=Condition&ay4=1&a_o4=0&authorid=110435&scoring=r). Nevertheless, I see definite room for improvement. For one, the sitesearch.ehobbies.com items were last updated in Google Base over two weeks ago, and freshness is a factor. Unfortunately, all the tips and tricks for how to go about optimizing for Google Product Search are outside the scope of this article. But perhaps that would make for a good future SEO how-to article topic. Request a site grade by emailing seo.report@practicalecommerce.com.